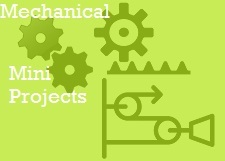 NevonProjects provides the widest list of mini projects for mechanical engineering topics and ideas for students, researchers and engineers at low cost. These simple mechanical project kits can be used as mini project as well as extensions in your own mechanical project implementations at very low cost. Our researchers constantly research on latest and simple mechanical engineering mini projects that can be useful for study and research. Our list consists of a wide variety of project that can be used as mini projects in mechanical engineering research and development. Browse through our list of mechanical engineering mini projects below. Need Custom Made Mechanical Project / System ? The above list of mechanical engineering mini projects is provided by nevonprojects for study and research on mechanical system. Our researchers constantly research on latest mechanical engineering projects topics and ideas to find the best mechanical mini projects topics for study and research.